Welcome to the 11th International Symposium on Visual Information Communication and Interaction (VINCI ‘18) that is arranged in Växjö August 13-15, 2018. The Symposium on Visual Information Communication and Interaction (VINCI) is the premier international forum for researchers and industrial practitioners to discuss the state-of-the-art in visual communication theories, designs, and applications. Registration latest on August 1, 2018. A journal article titled “Active Learning and Visual Analytics for Stance Classification with ALVA“, co-authored by a DISA researcher Andreas Kerren, was invited for a presentation at the ACM IUI 2018 conference which took place in the National Center of Sciences Building, Tokyo, Japan during March 7–11, 2018. The article was presented by Kostiantyn Kucher, a PhD student in Computer Science with the ISOVIS group at Linnaeus University. 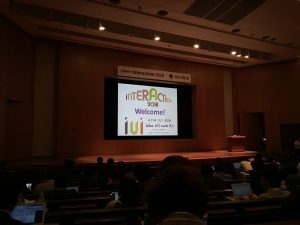 ACM IUI 2018 was the 23rd annual meeting of the intelligent interfaces community, where novel top-quality contributions in human-computer interaction, information visualization, artificial intelligence, and machine learning were presented. The main topics of interest during the conference seemed to be interactive machine learning (iML) and user interfaces for explainable artificial intelligence (XAI). Our article presented at IUI is very much relevant to these topics: it describes a visual analytics environment ALVA that is designed for annotation of textual data, management of an active learning classifier, and visual analysis of the intermediate data. ALVA was previously developed as part of the finished VR-funded StaViCTA project for stance analysis of social media texts, and we plan to adapt and apply it for future tasks in DISA research.